Starting off a special birthday-themed Maimi Sightings, fellow ℃-ute member Suzuki Airi shared this collage of 2-shots in her update on the official ℃-ute blog. Airi wrote that Maimi is a beautiful woman no matter where or by whom she’s seen, but is also scatter-brained. She continued on to say that no matter how much someone wants to, they can’t be like Maimi. Nakajima Saki attached this image she created to her update on the official ℃-ute blog, and wrote that she worries about her leader, and hopes that she’ll lean on the rest of the members more. 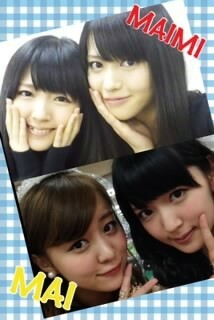 Fellow birthday girl Hagiwara Mai uploaded these pics to her update on the official ℃-ute blog. Mai wrote that Maimi’s outward beauty is likely a result of her inner beauty, and that Maimi is like an older sister to her. Batting last for the ℃-ute members, Okai Chisato shared this 2-shot with Maimi in her update on the official ℃-ute blog. Chisato wrote that she’s jealous of Maimi’s beauty, and how that coupled with her scatter-brained nature make her charming. Various other Hello! Project members wrote messages for Maimi’s birthday, including S/mileage’s Fukuda Kanon, who in an entry on her official blog wrote that Maimi’s smile and scatter-brained episodes always soothe her, and that she wants to become closer friends with Maimi. Maimi’s little cousin, S/mileage sub-member Takeuchi Akari, wrote in her update on the S/mileage sub-member blog that Maimi was her motivation for auditioning for Hello! Project Eggs, and she often e-mails Maimi when she needs advice. 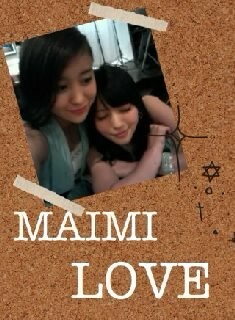 In addition, she wrote how impressed she was with Maimi’s solo version of “Ame” when she watched the video on YouTube. 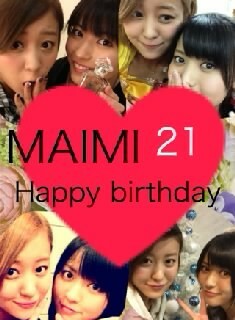 Another S/mileage member, this time Nakanishi Kana, attached this tiny pic and wished Maimi a happy birthday in her update on the S/mileage sub-member blog. Kana added that she’s envious of Maimi’s style, and that her smile is sparkling and cute on concert videos. 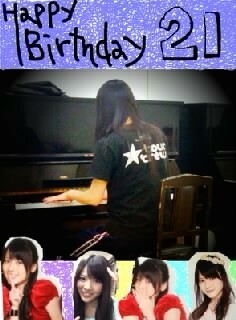 S/mileage member Katsuta Rina also wrote birthday wishes in her update on the S/mileage sub-member blog. Rina said that she’s happy when Maimi smiles at her backstage at the Hello! Project concerts, and that she respects her dancing. Posted on February 7, 2013, in Articles and tagged Fukuda Kanon, Hagiwara Mai, Katsuta Rina, Nakajima Saki, Nakanishi Kana, Okai Chisato, Suzuki Airi, Takeuchi Akari, Yajima Maimi. Bookmark the permalink. Leave a comment.